Add rounds you want to compare, by clicking on the “Add Rounds” button. Add stats, by clicking on the “Add Stats” button. You can find a brief explanation for each of them below. Click the close button on the right. Sort by clicking on the stats in the top bar. Adds the cartridge type to the table. A grain is a very small unit of measurement and refers to the projectile’s mass or weight. Adds the average dollar price per 20 rounds. The ballistic coefficient (BC) of a bullet is a measure of its ability to overcome air resistance in flight. The higher the value the less drag, and the more efficiently the bullet cuts through air. Indicates up until what yard (yd) the bullet remains in supersonic flight. A bullet’s flight path is more stable and predictable during this time. Value calculated using the bullet’s mass and diameter. If you compare two bullets with the same weight, the one with the smaller diameter (higher SD) will penetrate deeper (implying all other factors are equal), since it applies force to a smaller area. Adds recoil energy in Foot-pound (ft*lb) for the chosen rifle weight (7lb, 8lb, 9lb, …). Adds the velocity of a round in feet per second (ft/s) at the respective distance(yards). Velocity is equivalent to the bullets speed and direction of motion. Higher velocity, in combination with the correct barrel twist rate, results in a bullet more resistant to environmental influences making calculating long range shots in windy conditions less complex. Adds the bullet drop in inches from 50 up to 400 yards with the test firearms zeroed in at 100 yards. Adds the bullet drop in inches from 100 up to 1000 yards with the test firearms zeroed in at 200 yards. Adds the kinetic energy in Foot-pound (ft*lbf) of the bullet at the respective distance(yards). It’s an essential factor when looking at a bullet’s ability to stop a target. Adds the momentum in Foot-pound per second (lb/ft/s) of the bullet at the respective distance(yards). Momentum is the product of mass times velocity and an essential factor when looking at a bullet’s ability to stop a target. We utilized manufacturer data as well as recoil and ballistic calculators to compound the stats you see. We reached out to manufacturers for data that wasn’t publicly available and gathered information for hundreds of rounds, resulting in over 12,000 data points. If you have feedback or want us to add a round, feel free to reach out to us. Not a fan of numbers? We already did over 20 comparisons for you, covering every popular cartridge available. For those we picked 5 rounds of each cartridge for an in-depth comparison, along with 20 of each cartridge to provide a broader picture when it comes to averages. More than 400 rounds and more than 200 graphs for velocity, trajectory, “stopping power” and more! Click the cartridge you are interested in and see what we covered so far. Don’t know where to start? Read our ultimate rifle caliber guide. 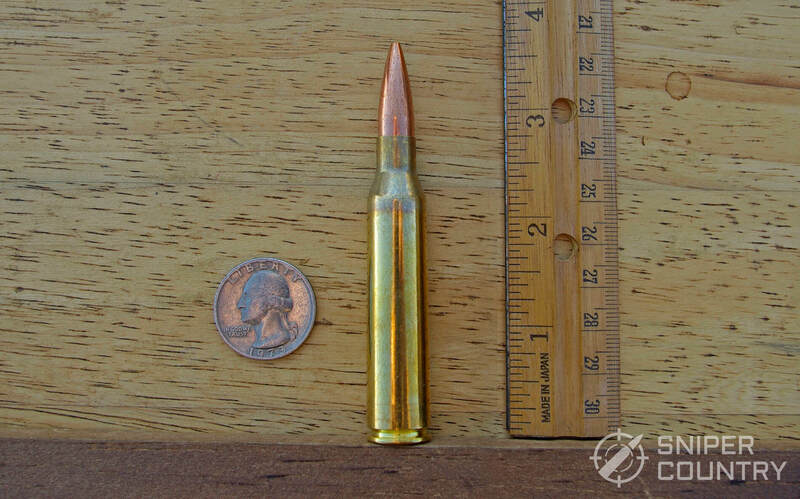 .308 Winchester vs 7mm-08 Remington – Though the .308 Win has a lot of history and is still regarded as one of the best short action, big game, hunting cartridges, a lot of sportsmen have begun looking to other cartridges, such as the 7mm-08 Rem. The 7mm-08 Rem was designed from the .308 Win. With this in mind, taking a look at how these two cartridges performed seemed to be a good idea for those choosing between the two. The most noticeable difference between the two cartridges was the difference in recoil. The 7mm-08 was designed to bring very similar performance to the table while cutting back on the amount of recoil. It’s only about 4-5ft.lb of difference, but that can be pretty significant for a lot of people. The same differences were seen with energy and trajectory. We had to split hairs to find differences between how these two cartridges performed. Check out the article for a much more in-depth look at how these two cartridges stacked up to each other. .308 Winchester vs .243 Winchester – From time to time, we like to compare two cartridges that are not often looked at together. The .308 Win and .243 Win is one of those comparisons. While both differed pretty dramatically in several categories, both the .308 and .243 are some of the most popular whitetail cartridges in the US. Not only that, but the .243 Win was designed with the .308 as a parent case. And this comparison is an excellent example of how two cartridges do overlap in some applications but also have their niche where one or the other will be better suited. Both of these cartridges have rounds that are perfect for medium sized game thought the .308 showed performance characteristics that were better suited for larger game, especially out at 300+ yards. We also saw pretty dramatic differences in recoil between these two cartridges. On the other hand, the high velocity and lighter bullets of the .243 are much better suited for varmint and predator hunting. As far as separate categories, we again saw some pretty interesting trends emerge. Check out the article as we go into much greater depth and look at the potential applications for these two cartridges. .308 Winchester vs .223 Remington – In this comparison, we wanted to take a look at two cartridges that would have pretty drastic differences in performance and subsequent applications. With the .308 Win and .223 Rem, that was certainly the case. It is obvious when looking at these two cartridges your choice is not going to come down to these two cartridges for the same hunting or shooting situations. Both cartridges excelled in specific categories, and both have tradeoffs that need to be considered when choosing one or the other cartridge and you will also find that careful consideration should be given to each specific round as we saw some significant variation in the performance between individual rounds of the same cartridge. Our article goes into much greater detail, but in short, the .308 offers much better stopping power than the .223 but also comes with a much more severe recoil. The .223 rounds showed flatter trajectories than the .308 rounds, though .308 rounds performed very well. The drawback in ballistics is the .223 rounds bled velocity at a high rate, and their low BC will be troublesome in less than ideal conditions at long range. .308 Winchester vs .30-06 Springfield – Looking at the .308 Win and .30-06 Springfield is a look into two cartridges riddled with Americana. Both of these cartridges, or some version of them, have seen extensive use in military campaigns, they both have vast followings in long range target shooting, though their popularity in that sector has fallen with the introduction of new cartridges, and they are both still two of the more popular hunting cartridges for medium to large game and capable of being effective at extreme hunting ranges. To tease apart differences between these two cartridges, we had to look at individual rounds to see significant differences. Even when we expanded our selections to more rounds, the differences were not too outrageous. The .308 Win had slightly less recoil energy even when using similar bullet weights to the hotter .30-06 rounds. Even in the long-range trajectory, there were .308 rounds that were very similar to the .30-06, which carries the reputation of being a pretty good long range hunting cartridge. This was a fascinating comparison for us that gave a lot of results we were not expecting. Definitely check it out. .308 Winchester vs 300 Winchester Magnum – This comparison came about to look at the differences and similarities between two cartridges that are often thought of as big game cartridges, though we came to the argument understanding that the 300 Win Mag specifically, would have a bit more power behind it than the .308. Regardless, we were interested in just how different these two rounds were, and the comparison led to some interesting talking points. While the 300 Win Mag carries a significant amount more energy and power than the .308, that also means a good deal more recoil. And while the 300 Win Mag showed increased performance in just about all categories, the .308 Win showed a performance that is more than capable of medium to large size game within 400 yards. Past that range, we really started to see an increase in performance for the 300 Win Mag. Of course, depending on what you are hunting, the 300 Win Mag might be a bit of overkill in certain situations. We look into this in a lot more depth in this comparison article and should be something to check out if you are thinking about trying out the magnum game. 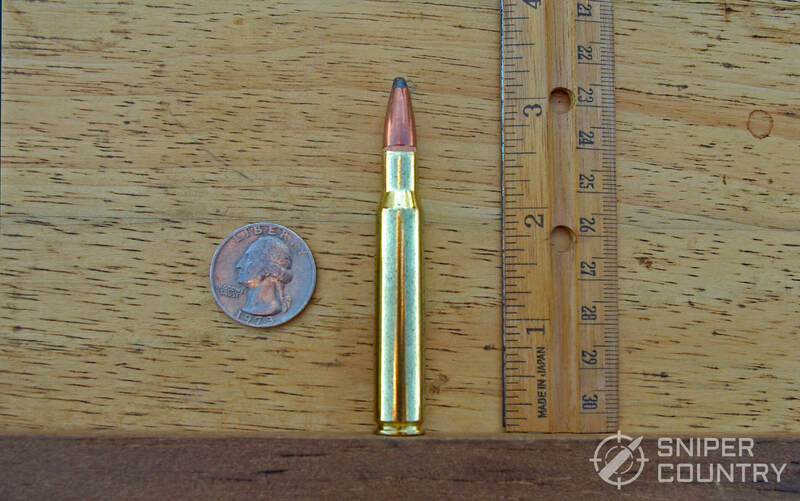 .308 Winchester vs .300 AAC Blackout – In this cartridge comparison, we took a look at two cartridges that utilize .308 caliber bullets but besides that fact, are extremely different in their performance specs and applications. From the categories we looked at, there is a clear difference in what these two cartridges should be used for, even though both are using a .308 caliber bullet. For hunting purposes, the .308 really outshone the 300 AAC BLK, especially when getting out past 150 yards. And that is not to say the .300 Blackout can’t be a fine deer or hog rifle; you are just much more limited in range. Even so, the 300 BLK has gained popularity for different applications, and we delve into and discuss these differences in applications. It’s a good example of how comparing the differences in performance data out of context can lead you to believe one cartridge is superior to the other. For hunting and accurate long range, there is no question the .308 Win is the more reasonable selection, but check out the full story in the article. .308 Winchester vs .270 Winchester – This comparison is another interesting article as these two cartridges are often debated as to which one is better suited for various hunting situations. From our sample size, which covered quite a few individual rounds for each cartridge, there were not gaping differences between the two cartridges. The .308 tended to not bleed velocity at as high a rate as the .270 rounds though they did show a significantly less amount of muzzle velocity. We also saw the .270 rounds have better trajectory at 400+ yards, but there were better performing .308 rounds. For stopping power, we again didn’t see very significant results and more consideration should probably be given to individual rounds rather than between cartridge types. Regardless, both of these cartridges carried more than enough energy for large game with 300 yards and more than enough for medium sized game out past those ranges. Those are just some general trends that we saw between these two cartridges. In the article, we dive into a lot more detail and take a look at a lot more performance specs. It’s an argument that’s never going to end, but we think we lay out reasons why both of these cartridges can serve you well. .308 Winchester vs .338 Lapua Magnum – The .308 Win has served in military and police force tactical situations for several decades. It was especially favored for a lot of long range shooting scenarios. In recent years, the .338 Lapua has replaced the .308 for a lot of users. The .338 Lapua was explicitly designed for long range performance while also being able to punch through barriers and several layers of body armor. As you can imagine, this type of application will result in some pretty drastic differences between the two cartridges. In this comparison, we see some major differences in the ballistic coefficients, kinetic energy, and sectional density. We also saw some differences in bullet trajectory, but up to 500 yards, the differences were not as drastic as you might expect. The further the range though, the more distinct the differences are with the .338 Lapua showing flatter trajectory. And all of this might point towards the .338 Lapua being a superior cartridge, but it all depends on the situation. The .308 is going to be much more manageable when hunting the more common North American game. Some of that has to do with the cartridge itself and also the rifle platform that is used. Check out the article for a more in-depth discussion on the topic. .30-06 Springfield vs .308 Winchester – The debate between these two cartridges is old, and even with the advent of newer cartridges, the debate between these two still rages. Both cartridges have a lot of history in military campaigns, long-range shooting, and especially in the hunting community. Because of that, we felt the need to take an unbiased look at several rounds from these two cartridges to see if we could tease apart any differences. And interestingly, we saw two cartridges that can easily be utilized in most of the same hunting applications when it comes to factory loads. We did see some differences between cartridges, though those differences were not too drastic. When looking at individual rounds, we could definitely see improved performance in long-range trajectory and kinetic energy for several .30-06 rounds. We also saw a slight increase in recoil energy generated by the .30-06 rounds. This comparison leads to a lot of interesting conversations, and we highly recommend this article for anyone contemplating one of these two cartridges. We go into much greater detail for a variety of ballistic and other performance specs for these two stories and still relevant cartridges. .30-06 Springfield vs .30-30 Winchester – As far as modern sporting cartridges, there are not many other cartridges that have the longevity of these two. The .30-30 was first released in 1894 and chambered in the classic Winchester Model 1894 lever action rifle. The .30-06 was releases not many years after in 1906 and the leap in cartridge performance in that time was quite dramatic. These two rifle cartridges had some pretty significant differences, and for long-range shooting, for target or game, the .30-06 is the clear-cut favorite. It has a much flatter trajectory, higher velocities, better ballistic coefficients, and carries a good deal more kinetic energy than the .30-30 cartridge. And while we expected this disparity, there is still a place for the .30-30 in today’s hunting world. It still has solid trajectory and more than enough stopping power for medium sized game under 200 yards. There are quite a few who still utilize this caliber for game as large as elk. The real limiting factor in its use is the trajectory of this round, especially when getting out past 200 yards. It also tends to lose quite a bit of energy. The other draw for the .30-30 is without a doubt, the low recoil and the ability to sling a rifle chambered for the .30-30 in tight brush. It’s an interesting comparison, and one that we think points out that though there are differences between cartridges, it’s a real loss on anyone’s part which rules out a cartridge simply because there are others out there that have higher velocities or excel in some other factor. .30-06 Springfield vs .300 Winchester Magnum – While the .30-06 Springfield is not a magnum cartridge, there is still quite a bit of overlap in the applications of these two cartridges. A lot of people might hear the word magnum and automatically assume that it is going to carry a lot more energy, have higher velocities, and have a flatter trajectory. While we did see an overall trend for the 300 Win Mag in this regard, the .30-06 was not that far behind, especially when looking at specific rounds. What you have to get at with comparisons such as this is if you really need the extra bullet energy or the 5 inches less bullet drop at 500 yards while taking on the couple extra ft.lb of recoil energy. Of course, those are not answers we can give. We do think that this comparison is a good look at magnum rounds and how different they are from some of the hotter non-magnum rounds such as the .30-06. .30-06 Springfield vs .270 Winchester – This particular cartridge comparison is a little more personal for me. I grew up in a .30-06 Springfield household. I always thought I would end up raising kids in a .30-06 household. Somewhere in there, I used a .270 Winchester and fell in love with it, and it has become my go-to deer rifle. With that, I was interested to look at the actual numbers between these two cartridges. The .270 Winchester and the .30-06 are derived from the same parent cartridge and are fairly similar in their design though the .270 is slightly necked down compared to the .30-06. This is one of those comparisons where there is a lot of hair-splitting. From our sampling of rounds, it was tough to find any trends for one cartridge over the other. The clearest difference was in the recoil, but even it was only a few ft.lbs more for the .30-06 average. It was a comparison where we felt the individual round had a lot more important when looking for a specific set of performance specs. We look at all of this and more including bullet weights and how that also might influence your decision based on hunting or shooting applications. .30-06 Springfield vs 7mm-08 Remington – After looking at the .30-06 Springfield round compared to the .270 Win, we wanted to take a look at the .30-06 compared to another round that is often debated with the .270 Win, the 7mm-08 Remington cartridge. Both are now popular cartridges in the hunting world and in the long range shooting community, though to a lesser extent. In this article, we delve into the details for these two cartridges which both taught the velocity, power, and trajectory for medium to big game hunting at the extremes of general hunting ranges. Speaking on just averages of the cartridges, there was not much difference between these rounds in just about any ballistic or other performance categories. Perhaps the most glaring was the increased recoil in the .30-06 rounds. We also saw a trend for the .30-06 rounds carrying a significantly increased amount of kinetic energy than the 7mm-08 though that is only one part of the equation for stopping power. Of course, you also have to take into account sample size, but with our ten rounds, as well as the averages for 20 rounds for each cartridge, the trends seem to hold up. Again, it seems that more preference needs to be given to individual rounds. While we go into much more detail, it is difficult for us to make huge assumptions. For larger game, you might be more comfortable with the .30-06 for longer range shots, but the 7mm-08 Rem can get the job done. This is a really interesting look at two cartridges and one that we highly recommend. .30-06 Springfield vs 7mm Remington Magnum – This was our second comparison between the .30-06 Springfield and a magnum round which should give you an indication of the power behind the .30-06. Even so, the .30-06, on average, falls behind in just about all performance specs of the 7mm Rem Mag. We like to look at these types of comparisons just because a lot of people might not have the right idea of what a magnum round brings to the table. And like we always try to mention, that type of performance is not always needed. And some people would still lean towards the .30-06, and we wouldn’t fault that at all, given the .30-06 is probably a bit easier to get a hold of and you can save a few dollars per box of cartridges. And again, while we saw a general trend towards the 7mm RM, there are individual .30-06 factory rounds that have much more similar performance as the average of the 7mm RM rounds. .270 Winchester vs .30-06 Springfield – For this argument, we are looking at two cartridges that are both derived from the same parent case, the .30-03. Not only that, but we are also stirring the pot of an age-old argument between these two popular hunting cartridges. Not only is it a debate between two popular cartridges but also a debate between two calibers, the .30 cal and 7mm rounds. When comparing these two cartridges, we found they were indeed very similar to the numbers for various performance specs. For the most part, the differences were more between individual rounds rather than trends between cartridges. Of course, more samples might reveal more distinct differences, but with twenty rounds each, we think the data will likely stand. Still, there were some important talking points. We did see the .270 Win rounds had a less recoil on average than the .30-06 rounds. Besides this, there was no significant difference between the averages of these rounds between the two cartridges. The .270 Win had slightly better trajectory on average (only 2inches difference), and that was the case for just about every performance spec. And we look into these categories in much more detail as well as look at how these numbers translate to real-world applications. While both can be used for the same medium to large size North American game, there will always be those who prefer the larger .30 cal. It’s an interesting topic that we cover in this article. .270 Winchester vs. 308 Winchester – In this article, we take a look at the .270 win and another popular and storied .30 cal cartridge, the .308 Winchester. Both are popular hunting rounds and for long range shooting, but to a lesser extent these days. When we looked at the various performance specs and data for these two cartridges, we did not see major trends between cartridges. Averages of the various rounds for each cartridge showed some small differences between the two cartridges, but for the most part, the largest differences were seen between individual round and sometimes for the same cartridge type. The .270 Winchester tended to have a significant amount more muzzle velocity, but by the 300-yard mark and beyond, the two cartridges ended up around the same average fps. The .270, on average, had lower recoil and also had a slightly better trajectory at 400 and 500 yards. Both have the stopping power to bring down most North American game, though the some might prefer the larger caliber .308. Where the argument really gets interesting is when it comes to long-range shots and is something we discuss in depth. .270 Winchester vs .243 Winchester – Through research and just being around other hunters, I have often heard people say whatever the .243 Winchester can do, the .270 Win can do better. Now, I have always been a man of compromise and hearing such assumptions has always bothered me. Because of that, we at swgguns wanted to dive into the numbers between these two cartridges. Both are smaller bore calibers and are often thought of as a whitetail cartridge rather than larger game through the .270 Win, as the numbers showed, has the potential for larger game. We did see some interesting differences between these two cartridges. First, the .270 Win had significantly more recoil than the .243. The .270 rounds had better ballistic coefficients than the .243 Win rounds, but the trajectories for these two rounds were not drastically different. The energy associated with these two cartridges was quite different with the .270 Win rounds carrying much more than the .243 Win rounds. While there were some distinct differences between these two cartridges and different applications, both cartridges have aspects to their performance that would make them attractive to a hunter or long-range shooter, given their needs. In the article, we go into much greater detail. .270 Winchester vs 7mm-08 Remington – This comparison really intrigued us when we set out to complete it. Both of these cartridges represent a general trend we see in the hunting and shooting community as a whole, and that is for lower recoil, high velocity, and flat trajectory rounds. And who can blame anyone who wants that in their ammo? Both of these are 7mm rounds, and both are often chosen for the same reasons. In our comparison, we saw the .270 Win, on average, had less noticeable bullet drop than the 7mm-08 out at 600 and 700 yards. Within 500 yards, there was no difference between cartridges though there were better rounds for each. The same advantage was seen for the .270 Win for velocity, energy, and momentum. And again, this is just the average, and there were 7mm-08 rounds that outperformed .270 Win rounds in certain categories. The 7mm-08 cartridge did show about two ft.lbs less recoil than the .270 Win. In the article, we detail these categories more closely, and we also try to explain why we see these differences between these two 7mm caliber cartridges. .243 Winchester vs .270 Winchester – In this comparison, we take a look at two smaller caliber cartridges that are both popular in the hunting community, especially when it comes to whitetail and other medium-sized game. In our comparison, we did see some distinct differences. The first was the difference in recoil. The .270 Win rounds had significantly more recoil, but it also provided more velocity and stopping power than the .243 Win. We also did not see much difference in the averages of the two cartridges when it came to trajectory though the trajectory varied for the .243 rounds depending on the individual round where the .243 has some very light bullet options. And while the average trajectories were different, the .243 rounds tended to have lower BCs, but again, some were higher than others. We think that these two cartridges have a lot of overlap, but also excel in opposite ends of the category. Where both are suitable for medium sized game at normal hunting ranges, the .243 Winchester with its choices for ammunition makes it ideal for varmints and other small game at long range as well. .243 Winchester vs .308 Winchester – This comparison is interesting because the .243 was designed with the .308 Winchester being the parent case. The .243 was necked down to take smaller caliber bullets, among other modifications, but resulted in a high velocity and low recoil cartridge. There were some distinct differences between these two cartridges and while there is overlap in their applications, we think both can be more effective in certain situations, which we look at in the article. The .243 Win rounds certainly bring less recoil, but they still have as high or higher velocities than the .308 Win rounds. The .243 rounds also had flatter trajectories on average and were more noticeable at 400 and 500 yards. The weight of the bullets used was definitely a factor in the flatter trajectories and is something that we discuss more in the article. There were other significant differences, such as bullet energy, and all of it we cover in depth. .243 Winchester vs 6.5mm Creedmoor – The 6.55mm Creedmoor is the frontrunner for the rising popularity of 6mm cartridges. Though 6mm cartridges are not necessarily new, the 6.5CM has garnered a lot of attention and rise in popularity over the last few years, especially in long range competitions. The .243 Win is also a popular long range round, though many have begun to dismiss it for the newer cartridges. Because of that, we wanted to take a look at these two cartridges and see if the numbers back up the trend towards these newer cartridges. In the comparison, we do see that on average, the 6.5mm CM excels in a lot of ballistic categories over the .243 Winchester. 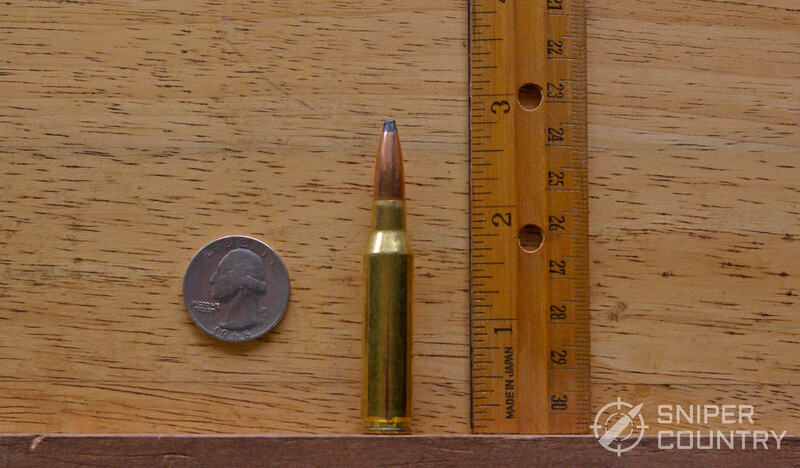 And though we see a lot of advantages for the 6.5mm CM, that shouldn’t lead you to think the .243 can’t compete. Several .243 rounds give just as high performance, especially for long-range use, as the 6.5mm CM. One of the biases that come up is there are a lot of .243 rounds more suited for medium sized game hunting, and they don’t bring the long range performance. It’s something to keep in mind and something we discuss more in the article. 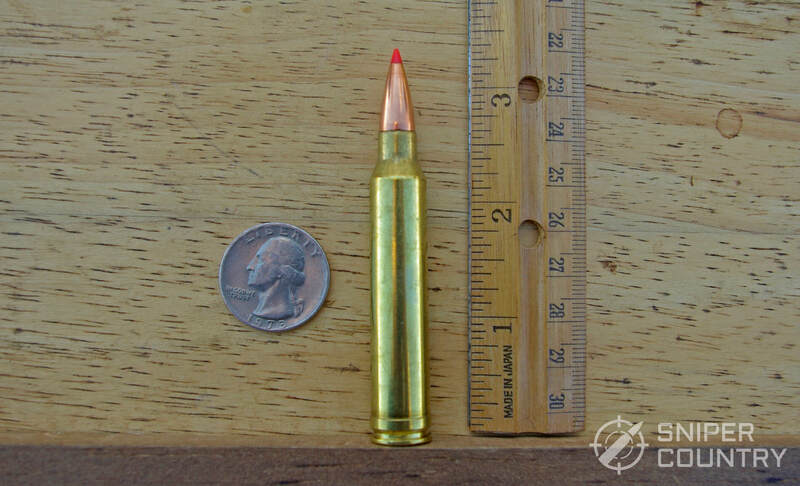 .243 Winchester vs 6mm Creedmoor – The 6mm Creedmoor is the newest competitor in the modern shooting world, and while it is most definitely still proving itself in the field, the potential for this cartridge is undeniable. We wanted to compare it to a proven hunting cartridge and a cartridge that is still more than relevant in the long range shooting world, the .243 Winchester. We saw a slight advantage for the 6mm Creedmoor in every ballistic category as well as categories for stopping power. The 6mm Creedmoor rounds did have slightly more recoil. And we should note that in this particular article is limited due to the small selection of factory loaded 6mm Creedmoor rounds, but we hope to have that updated here recently. 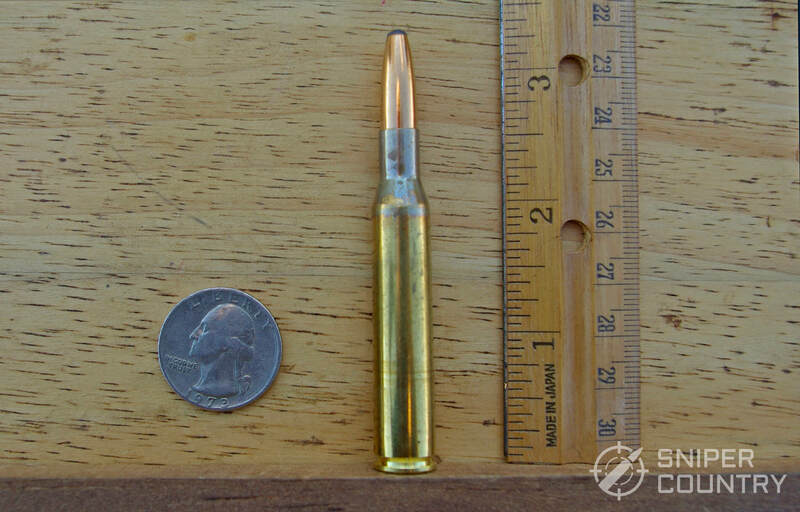 And like we said, the .243 Winchester is a proven round, and there are certainly rounds available that performed as well or better than the average 6mm Creedmoor. While the potential is there, we are interested in how the reviews come back for this cartridge. As things stand, there are much more options for rifles chambered for the .243 and more choices and availability of ammunition. .300 Win Mag vs .308 Winchester – In this comparison, we are comparing the 300 Win Mag to a non-magnum .30 cal cartridge, the .308 Win. We went into the comparison with an understanding that the 300 WM was going to outperform the .308 Win in a lot of categories and anyone with some understanding of cartridges would know that as well. What we wanted to make clear in the article was that though the .300 Win Mag excelled in all performance categories, the .308 was still a capable cartridge for medium to large sized game. Both utilize heavier weight bullets but maintain supersonic velocities out to 500 yards, and both carry more than enough energy to take down large game. For the moose or other large game, especially getting out past 400 yards, the 300 Win Mag is undoubtedly the better option with the flatter trajectory and significantly more kinetic energy. The main drawback, and we use that term loosely, is the increase in the recoil of the .300 Win Mag. Now, if you want the performance of the .300 Win Mag, it is something you will have to adapt to. And we don’t want to make it seem like the .308 was crushed by the performance of the .300 Win Mag. While there was a trend towards all of the .300 Win Mag rounds we looked at having better numbers, the averages were not that dissimilar in all categories, and the .308 Win does have several rounds that can provide performance more similar to the .300 Win Mag. All of this we look at in much greater detail in the article. .300 Win Mag vs .30-06 Springfield – In this comparison, we again look at the .300 Win Mag when stacked up to another non-magnum .30 cal cartridge and probably one of the most popular hunting cartridges in the modern rifle era, the .30-06 Springfield. And when you get into comparisons with two popular cartridges such as these, the argument almost always devolves into a shouting match. So, we decided to look at the numbers and from them, draw some conclusions as to which hunting or shotting scenarios each cartridge might serve you better. The averages pointed towards the 300 Win Mag in all the performance categories, and that is to be expected, it is a magnum round, and it is using heavier bullet weights than the .30-06 though also loaded with much more propellant. And yes, there are better performing .30-06 rounds, and we did not delve into handloading. Both can bring down medium and even large game, for the .30-06, especially with a well-placed shot. The question is, for those shots at extreme ranges for hunting or target shooting, do you need the extra 200fps of velocity, ten inches less bullet drop, and 500 to 1000 extra ft.lb of energy? Most people would say yes, as it does make things a little easier, especially with heavier bullets and higher BCs which help deter wind drift a little better. In the article, you will find that both cartridges are as popular as they are for a reason and both deserve a spot in your gun safe, it’s all about what you want to do with the cartridge. .300 Win Mag vs 7mm Remington Magnum – Ah yes, the 300 WM versus 7mm Rem Mag debate. Released in 1963 and 1962 respectively, these magnum rounds have been compared for five decades now, and even with the release of other popular magnum cartridges, both remain extremely popular in the outdoor community. A lot of what pushed us to begin making these articles was becoming tired of seeing the same arguments with no numbers to back it up, and talk of amazing hip shots at 500 yards and not having to track the animal an inch. Perhaps not that absurd, but we thought comparing the numbers from a selection of rounds for each cartridge might give you some better insight. In our comparison, we first came to the conclusion that both are dang good cartridges, but there were some interesting differences between the two, and we take some time to dive into these small differences. With trajectory, the 7mm Rem Mag had a slightly higher average than the .300 WM, but both had rounds that outperformed rounds of the other cartridge. And the biggest differences when not noticeable until you got out to the 600 and 700-yard ranges which are not often relevant in hunting situations. From our selected rounds, the 7mm Rem Mag had better BCs though again, the 300 Win Mag had excellent ratings for some rounds, and there are more rounds out there we did not examine in depth. The most obvious advantage for the 300 Win Mag was the kinetic energy associated with the bullets. With heavier bullets but not a significant drop in velocity, the .300 Win Mag round showed higher average energy and momentum numbers which can translate to a bit more stopping power. And though there were these differences, we think that either cartridge in the hands of a skilled hunter or marksman are going to get the job done. .300 Win Mag vs .338 Lapua Magnum – In this comparison, we take a look at two magnum rounds that are both sought for long range shooting. While the .300 Win Mag is also a favorite hunting cartridge, the .338 LM has some limitations in the field and is a topic we cover in the article. One of the limitations of this round in the hunting field is the size rifle that you need to even begin handling the recoil of this round. It would be very unwieldy if you needed to walk anywhere. In our recoil charts, we saw a huge increase in recoil for the .338 LM even with a much heavier rifle weight. If you want a round for long range shooting, it’s hard to look over the .338 LM when compared to the .300 Win Mag. While the velocity of the WM is similar to the .338 LM, it is also with much lighter bullets than the .338 LM. Regarding ballistic coefficients and trajectory, especially at 500+ yards, the .338 LM has a significant advantage. The .338 LM also had much more kinetic energy and momentum than the .300 WM, but it’s so much it is overkill for North American game though it is popular for the largest game animals in the world. Again, it all depends on the circumstances you wish to use your rifle and the cartridge it is chambered for. .300 Win Mag vs .300 Winchester Short Magnum – In this article, we take a look at two cartridges that are similar in name and similar in applications but don’t be mistaken that these cartridges are interchangeable. And in this article, we go into more detail on why the short magnum was created, and it benefits. Recoil is not, in the end, different between these two cartridges because of the rifle weight often used between the two cartridges. Though the .300 WM produces more recoil energy, the actual felt recoil will be similar. For other ballistic and performance categories, we again do not see any trends between cartridges, but rather a difference between individual rounds. Both have rounds with similar bullet weights, and both have rounds the perform better in certain categories. While both can be used in the same hunting and shooting scenarios, it comes down to rifle choice in our opinion. If you want something a little lighter and easy to handle in tight quarters, the WSM might be a better option. If you need a longer barrel for long range hunting and the option for slightly heavier bullets, the .300 WM might be your choice. .338 Lapua Magnum vs .300 Winchester Magnum – Both the .338 LM and the .300 Win Magnum are more powerful cartridges that are available to the public though that might be an understatement with the .338 LM. Where a lot of hunters will probably consider the .30cal magnums top of the totem pole regarding packing a punch, they are pretty mild when compared to a .338 LM launching a 280gr bullet at the same velocity. Both of these cartridges are often utilized for larger game and able to take them cleanly at 400+ yards. With that, the .338LM is more often reserved for the largest and most dangerous game. Even so, we thought it would be interesting to compare the .338 Lapua Magnum with a cartridge that might be more well known to most hunters and marksman to give you a better reference. When we compared the two cartridges, we saw a pretty distinct advantage for the .338LM in most categories, other than lighter recoil. The .338 LM had much higher muzzle velocity on average, though the two cartridges tended to even out as they moved downrange. And interestingly, the averages for bullet drop through 700 yards was not very different. In fact, there were several .300 WM rounds that outperformed some of the .338LM rounds, but to be fair, the difference was not much, and the .338LM rounds were nearly 100gr heavier. For bullet energy and momentum, the .338 LM had a significant advantage. And this, along with recoil and rifle weight, is where the two cartridges diverge in applications and is a topic that we get into in the article. .338 Lapua Magnum vs .308 Winchester – There was a time where the .308 Winchester was a much more popular long range cartridge, and that is not to say it is not relevant anymore. A lot of military and other tactical snipers utilized the .308 Winchester cartridge, though the .338 LM has replaced the .308 in a lot of circles. Because of this history behind the two cartridges, we wanted to take a look at the two with their data side by side. And what we saw was a clear advantage for the .338 LM in just about every ballistic and performance category, and that is the case with the .338 LM with just about every smaller caliber. And just like the previous comparison, the one area where there was more similarity was the velocity. The .338 LM still had, on average, faster velocity but there were .308 Win rounds that were up there. That’s not a knock on the .338 LM though as the bullets moving at this speed are anywhere from 100 to 150 grains heavier. This also results in the .338 LM rounds having nearly double the recoil energy even with a much heavier rifle. If you look at the data, it’s easy to say the .338 LM is the superior round, but it’s not the case when thinking about these cartridges with specific applications in mind. The .308 has more than enough stopping power and decent ballistics to be used for just about any North American game, and you don’t have to worry about hauling a 15lb rifle around the backwoods like you would the .338 LM chambered rifle. On the other hand, if you are hunting big African game, you might deal with the increased weight of the rifle for the heavy stopping power of the .338 LM. .338 Lapua Magnum vs .50 BMG – This comparison is still one of our favorites just because of the numbers involved. Both the .338 Lapua Magnum and the .50BMG, to an even greater extent, are large cartridges that launch heavy bullets at incredible velocities. We took a look at several available factory loads for each cartridge, and though we expected the results we saw, it was still incredible to us. The bullet weights will make you do a double take for both with the .338LM rounds having rounds up to 300gr while the 50BMG rounds are sending bullets downrange in the 650 to 750gr range. Velocities for these two cartridges are pretty similar, and there is not a general trend between cartridges, and as you can imagine, for the 50BMG rounds at similar velocities means devilish recoil. And with such heavy bullet weights, the stopping power of these rounds are also quite impressive. 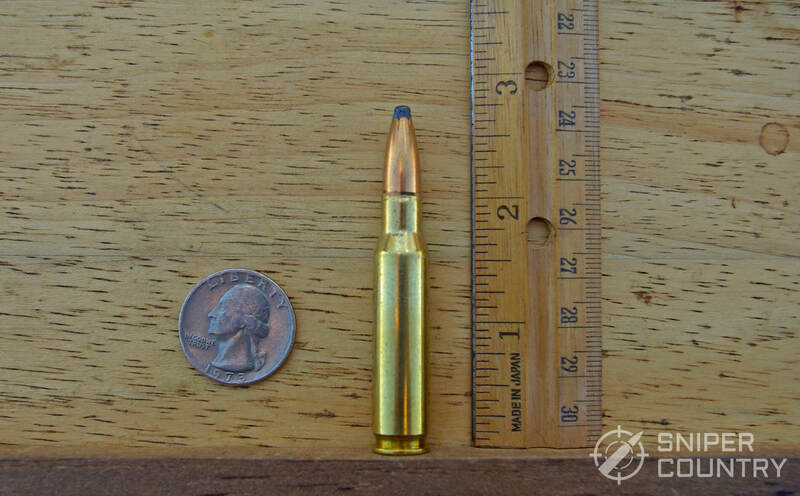 7mm-08 Remington vs .308 Winchester – As we mentioned in the brief overview, these two cartridges are close relatives as the 7mm-08 was designed with the .308 Winchester as the parent case. There are differences between the two cartridges including neck length and case capacity. With these two cartridges, we were interested in how these changes in the case design and the different caliber bullets would be similar and different. Both of these cartridges can be utilized for much of the same hunting and shooting applications which also makes this comparison intriguing. As with all of these articles, we looked at a variety of ballistic and other performance categories between the two. We found a lot of similarities between these two cartridges but there were some key differences in the overall averages of these rounds in the trajectory and bullet energy categories and provide interesting discussion in the comparison. Perhaps the biggest difference between the two is in the recoil, which may or may not sway you towards one of the cartridges. 7mm-08 Remington vs .30-06 Springfield – In this article, we wanted to take the 7mm-08 Rem and compare it to perhaps one of the most popular, non-magnum hunting cartridges, the .30-06. With the popularity of the .30-06, it might be easy to assume that it outperforms the 7mm-08 in most categories, but we didn’t find that to be the case. Of course, there are other factors that go into the choice between cartridges that we did not cover. There were a few categories where we did see some differences including the much lighter recoil of the 7mm-08. Both cartridges had very similar averages for the long-range trajectory with no major trends seen between the two cartridges. 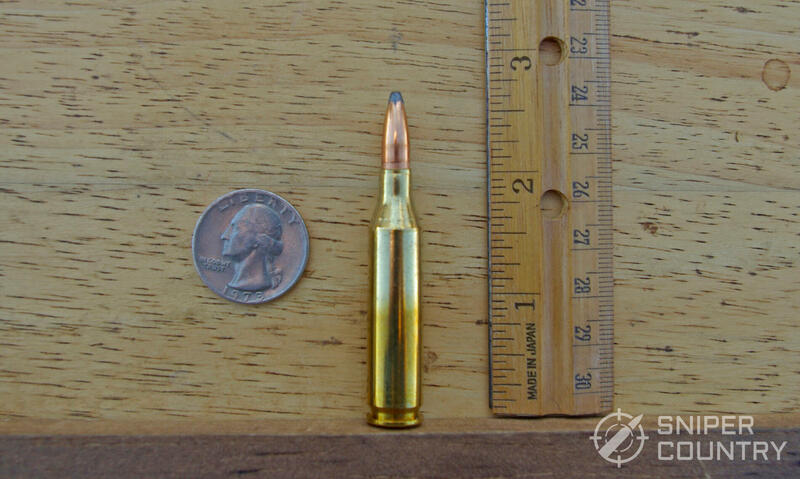 We did note that the flatter .30-06 rounds were much lighter and might not be what you want for a hunting cartridge. For bullet energy, we did see higher ft.lbs of force when looking at the averages of the two cartridges, but there was not a large difference, and there were several 7mm-08 rounds that brought close to or more energy than some .30-06 rounds. It’s an interesting article because of how similar the numbers are between these to cartridges. Of course, there are plenty of differences, and we take a look at both. 7mm-08 Remington vs .270 Winchester – Both of these cartridges fall into your options for the same shooting applications, and they are often compared and debated over which is better. Of course, we don’t think the idea of claiming one to be better than the other has much merit. Both were designed to be high-velocity cartridges with lighter recoil, flat trajectory, and still carry enough power for excellent terminal ballistics for most North American game. In our comparison, we saw that both of these cartridges provided very similar numbers. And as we mention in the article, these numbers can change as the rifle specs often vary between cartridges and we kept all these variables the same when possible. And while the numbers were similar, there were some differences that we could point out. We saw the .270 Win had less noticeable bullet drop than the 7mm-08 out at 600 and 700 yards when looking at the averages of the two cartridges. Within 500 yards, there was no difference between cartridges though there were better rounds for each and that includes the 600 and 700-yard markers. For hunting purposes, you are probably only interested in the shorter ranges where there was no significant difference. The same advantage was seen for the .270 Win for velocity, energy, and momentum. And again, this is just the average, there were 7mm-08 rounds that outperformed .270 Win rounds in certain categories. The 7mm-08 cartridge did show about two ft.lbs less recoil than the .270 Win which might be a big factor for some people. There is a lot more to discuss between these cartridges, but our main take away from this comparison was that you would probably be happy with either one. At the moment, our handgun cartridge comparison section is a bit more limited than our rifle one, but we plan on rectifying that shortly. In the meantime, we do have several articles that look at some of the more popular and more infamous handgun cartridges that are available as well as a handgun caliber guide. In the following articles, we take a look at recoil, velocity, energy, and their performance when used in pistol-caliber carbines, when acceptable, including the trajectory. We have linked all of these articles below, along with a short intro. 9mm Luger vs 10mm Auto – In this cartridge comparison, we looked at the most popular self-defense round, the 9mm, and a cartridge that has risen and fallen in popularity over the years, the 10mm Auto. In the article, we go into great detail outlining which situations each of these cartridges might be better suited for. Without getting into too much detail here, we did see some pretty dramatic differences in the data between these two cartridges including the recoil, velocity, and most certainly the bullet energy where the 10mm rounds provided 2x or more ft.lb of force from the muzzle out to 50 yards. Of course, more is not always better or necessary and is a topic we spend a good deal of time on in this article. 9mm Luger vs .357 Magnum – In this cartridge comparison, we take a look at two of the more popular handgun cartridges but also two very different cartridges. Usually, if someone is trying to pick between the two, they are unsure of what they need in a handgun, or they need to go ahead and splurge a little and get both. While both can be used for a lot of the same applications, they do not feel or shoot the same, and that is apparent when looking at the data. Both of these cartridges use pretty similar bullet weights, but you can find heavier bullet offerings with the .357 Mag. One of the biggest differences was the recoil. And after you look at the casing specs and the difference in velocity, the huge increase in recoil for the .357 Mag makes sense. We covered these and other glaring differences between the two cartridges. 10mm vs .45 ACP – This cartridge comparison was so interesting to us because of how these two cartridges go up earning their reputation. Both are considered heavy hitting rounds that are used for protection from dangerous game and also for bringing the power to stop a home invasion quickly. And what is so interesting is that both are pretty different but get to the same conclusions. The 10mm is a smaller diameter cal, but it showed higher velocities and higher bullet energies than the .45 ACP. We also did not see much of a difference in the recoil energy generated by these cartridges, but your handgun is going to play a role in that category. There are advantages to the .45 ACP even though just looking at the numbers might make you think otherwise, and we spend a significant amount of time on this topic. We also take a look at performance when used in a carbine which we think is pretty unique for these articles. .357 Magnum vs .44 Magnum – In this comparison, we take a look at two magnum handgun cartridges that are high velocity and hard-hitting. Both of these often compete for space in the same niches, so it gives the article some real-world significance. Just from the names, you can already tell that there are going to be some distinct differences in the numbers for these two cartridges. The .44 Mag is a significantly larger diameter than the .357 Mag and has much heavier bullet weights available. The recoil between these two cartridges can vary, but the .44 Mag often produces a significantly larger amount of recoil than the .357 Mag. There are some general trends between these two cartridges that we discuss in pretty great depth, but in most cases, there are rounds for each that excel or fall a bit short in each category. We compared the 5.56x45mm NATO versus the 7.62×39 and the results are definitely worth checking out. If you want to learn more about the history of the 5.56×45 NATO Cartridge you should click here. Last but not least we did a comparison on the .458 SOCOM versus the .50 Beowulf.